Glad to say, we have a mighty fine 3 hour show for you for April, including a mesmerising end of show mix that's sure to relax you after the usual chaos of our main segment. What have we got lined up? Well, loads of new releases will be flying out of your speakers courtesy of Obscenity State, Newmeds, Ernest Moon , Rivers And Suns, Mammoth Penguins , SPQR and SPC ECO . There's also a stack of new acts to share with you, including Secret Treehouse, The Shrubs , Alexandra Babiak, Pipaluk & Cecilie Supernova, New Me and Paris Love-Child. Winter Gardens and Swimming Pool provide two absolutely splendid new shoegaze moments, plus there's plenty of electro from the likes of Symbion Project , Dadanaut, Ed Wynne , Flency, Redshift and Blackhill Transmitter . We have more tracks coming your way from show regulars Transmission 13 , Whettman Chelmets , Evi Vine , Life As Surface Noise and Amyl & The Sniffers. Pushing the boundaries of time, the Dutch delight, Arjen Schat , entertains us with by far the longest track we have ever broadcast. Even our butler, Merriman, pops up with a tune of his choice. 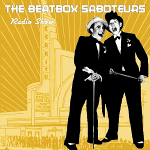 The Beatbox Saboteurs are Blu and Skreen B, we are a couple of miscreant toffs from the South of England who simply like making and listening to music. We are probably most well-known for being members of the Cuban Boys, the band who became an integral part of the John Peel Show in the late 90s and, amusingly, through a sequence of fortunate events, ended up being signed to the EMI mothership and gatecrashing the UK charts. We charted higher than S Club 7, pretty good for a "bad Technohead tribute band". However, winning John Peel's Festive 50, recording a couple of sessions for him and having our homemade CDRs played on his show remain our greatest achievements. The Beatbox Saboteurs formed as an escape pod from the Cuban Boys, aiming to further propel the tradition of twisting popular sound recordings into something fresh and interesting. Call it smiling entertainment with a devilish grin. Once again, we found ourselves adored by John Peel, along with an ever-expanding rabble of DJs from radio stations all around the globe. Between 2002-03, the Beatbox Saboteurs released a rapid succession of albums and special one-off recordings before taking the decision to disappear before the lure of corporate labels tainted the project. Aside from The Beatbox Saboteurs, we have been involved in many music projects. Our early days as schoolboys were spent making horrendous metal-bashing experimental noise but since then we have worked in nearly every genre: goth, synth-pop, techno, classical, ambient, drum & bass, pop, dance, rock, electro and possibly even novelty pop. We now run a micro-label called House Of Beauty Records and enjoy the freedom to create whatever takes our fancy. We are goths at heart but can see the wonder of light. If you want to send us a dodgy demo then we would love to hear it!